Approximately a dozen typescript letters written primarily by Myra Montgomery (1794-1817) to her cousin and subsequently, fiancé, Horace Henry Goodman (1785-1849) survive in the Collections of the Haverhill Historical Society, Haverhill, NH. and the New Hampshire Historical Society, Concord, NH. Although small in number, the letters nonetheless constitute a valuable source of information on an affluent young woman and her family in the early Republic. 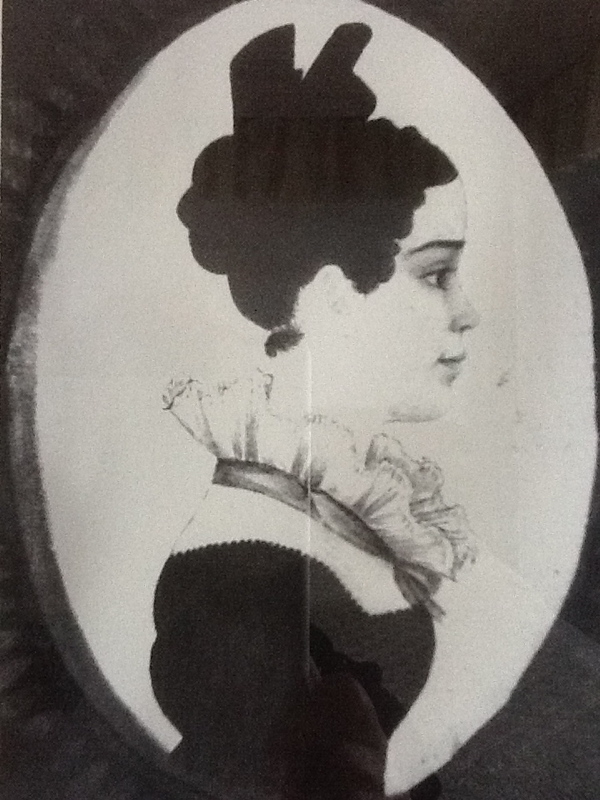 While living in a rural town, she had access to much wider intellectual, artistic and literary circles, through her Boston education at the progressive Mrs. Susanna Rowson's School and Haverhill's role as the seat of the North County Court system, which drew several hundred individuals throughout the year. General John Montgomery's business interests necessitated an ongoing round of social engagements. Consequently, this required that his daughters fill the role of hostesses to manage the ritual events in the parlor of the commodious Georgian home: teas, dinners, music, dancing and other activities characteristic of the early republic. Once Myra's older sisters had "gone to housekeeping" and while her mother was sick during 1815-16, more of the burden fell on Myra. 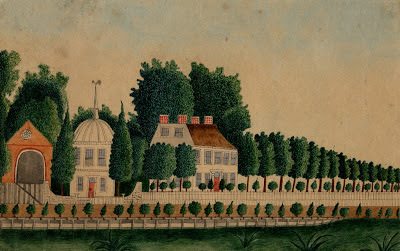 She was well - equipped to handle all manner of social discourse, for, when she was thirteen she spent several months at Mrs. Rowson’s Academy in Boston (1807-1808). Myra clearly made quite an impression on the highly regarded head of school. As a man of means, the General could afford to send his three oldest daughters—Mary (1790-1869), Nancy (known as Ann, 1792-18? 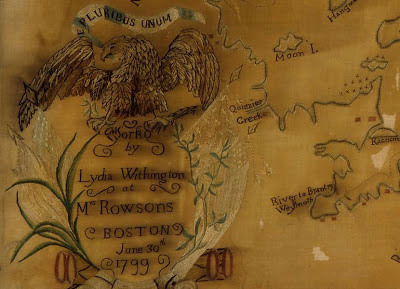 ), and Myra—to the well-known academy of Mrs. Susanna Rowson in Newton and Boston in the early years of the 19th century. [ii] From the tuition and “extras” billed to the General, we learn that the girls were trained not only to complete their silk embroidery, but also in the use of drawing paper, pen and ink, and music. Furthermore, the two older girls attended a play via carriage, as well as going to meeting. 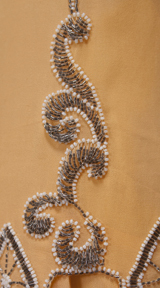 As of this writing, none of their silk embroideries are currently known. Mrs. Rowson stayed in contact with many of her former pupils, expressing an interest in their activities. For example, in the same letter, she goes on to discuss Mary's forthcoming marriage "I understand that you are about to discard the name of Montgomery and adopt another ....(Batchelder)"
Myra became ill in November of 1816, and succumbed to what was most likely consumption. She died on April 14, 1817 in the house where she lived most of her short life. You can visit Myra's burial site, along with that of her father, General John Montgomery, her mother and step mother, Patience, at the Ladd Street Cemetery, not far from where her home still stands along the Oliverian Brook at the junction of Routes 10 & 25 in Haverhill, NH. Excerpt from forthcoming article '"So Dreary An Aspect" The Haverhill Letters of Myra Montgomery." Available September 2013. [i] Susanna Rowson to Mary Montgomery, January 8, 1808, in Elias Nason, ed., A Memoir of Mrs. Susanna Rowson, with Elegant and Illustrative Extracts from her Writings in Prose and Poetry (Albany, NY: Joel Munsell, 1870), 147. [ii] Mary attended Rowson’s school for 15 weeks in 1805, and Ann boarded there for 23 weeks during the winter of 1804-1805. Myra attended for a short time, apparently to finish her silk embroidery, in 1807 and early winter 1808 at age 13 part of 1807 and early winter of 1808 there. For more on Mrs. Rowson's school and her pedagogy, see Jane C. Nylander, "Useful and Ornamental Education for Young Ladies: Mrs. Rowson's Academy, Boston, 1797-1822," New England Ancestors (January 2006): 19-26 and 51. 1. Mrs. Susanna Haswell Rowson, 1762-1824. A novelist, playwright and head of a progressive school for young women in Boston, Mrs. Rowson also wrote "Charlotte Temple." Many sources exist which discuss Mrs. Rowson in detail, including the two cited here. Courtesy of University of Virginia Library. 2. Myra, Mary or Ann Montgomery, artist unknown, c. 1800-1815. 3. Mrs. Rowson's School, Washington Street (near the Roxbury line), South End, Boston. 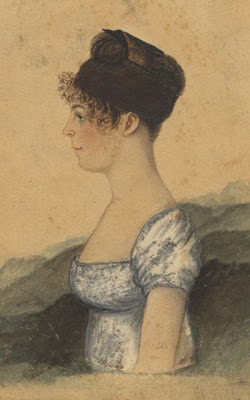 Watercolor on paper, artist unknown but may have been a student, 1807-1809. Courtesy, The Boston Society #1919.0015.001. The elaborate architecture and landscape along 'Washington Neck"would have been a high visibility landmark in post-Revolutionary era Boston. 4.Lydia Withington, detail, silk embroidery of Boston Harbor, 1799. Completed at Mrs. Rowson's School. Although none of the Montgomery girl's work is currently known to survive, this named and dated piece may serve as an example of the nature and quality of work completed under her tutelage. 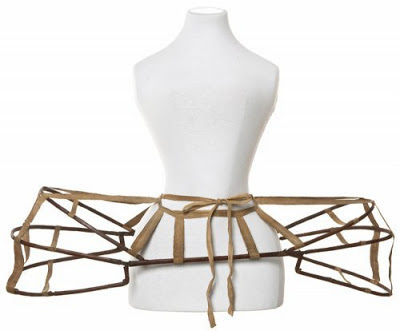 A tale of the male pannier or...a lost garment of the eighteenth-century. Monsieur Fauteil! Your arm is in the way of my pannier! Furniture builders adapted the armchair form to accommodate panniers, usually described as a woman’s undergarment constructed of wire or cane that widens the hips. However, Felice also indicates pannier’s for men. While he does not name his source directly, he does acknowledge several sources in the beginning of his book. Thirty years later, Verlet notes the shift in arm placement, but only refers to women’s hooped skirts, or panniers, as the reason. So why does Felice reference male panniers? Did such an undergarment exist for men, or does pannier in this instance refer to the result, but not the mode? In or around 1720, Jacques Rigaud (1680-1754) left Marseilles and traveled to Paris, where he created a series of engravings of the city’s environs. Based on this success he then created a series of engravings of the royal palaces of France and in 1730 he was invited to England to create a series of engravings there. These series of engravings display a cross section of dress within and across the social milieu during this period. 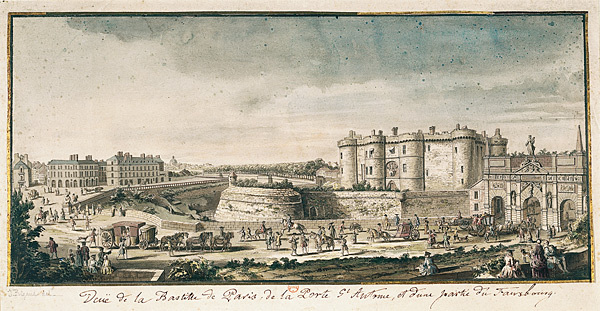 Rigaud’s ‘Vue de la Bastille de Paris, de la Porte St. Antoine d’une partie du Fauxbourg’ of 1720 shows the St. Antoine gatehouse, one of the entrances to Paris, which was located next to the Bastille. (http://classes.bnf.fr/livre/grand/627.htm) While there are a number of men in coats, two figures in the lower right of the engraving are of particular note. Seated with their backs to the viewer their coats display an odd shelf, which seems to resemble a posterior pannier. It appears that some type of form holds the backs of the coat skirts in a rigid manner. 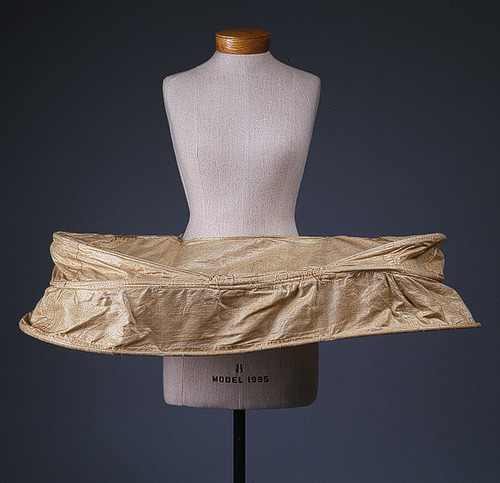 How is this form maintaining its shape under the weight of the fabric and the positioning of the bodies? Is this the pannier that Roger de Félice references? It may be contrived, but it seems an odd affectation in an otherwise mundane view of travel and commerce. The images above and below are from the engraving. To date, any examples that I have found of early 18th century male coats note an inner layer of buckram or horsehair, but no other forms of manipulation. This engraving seems to indicate that more yjan starched lining is being used to create a panniered appearance. So where have all the wires and whalebone gone? The history of the male pannier has been considerably shrouded, perhaps in part because so few examples remain extant - coats were costly, constantly updated to the current styles, wires removed and stiffners relaxed. As I have discovered, the fullest accounts appear in relation to furniture adaptations or in prints. It appears that this form of male attire occurred primarily in the first half of the eighteenth century, paralleling that of women's fashions. Jeff Hopper writes about historic men's garments for Silk Damask. This is excerpted from a forthcoming article. Madeline Sirois Parker loved color. Living in Aroostook County Maine, the sunny days were revered and often called for excursions to pick fruit and enjoy a picnic. She loved her flower garden and had not only a green thumb but a true sense of color, embodied in her orange “flapper” wedding dress, currently on view at the American Textile History Museum as part of the exhibition Behind the Veil. Madeline’s personality shines through her wedding dress selection. According to her granddaughter, Janith Bergeron, Madeline was always a very “colorful” person. Since Madeline lived in a very rural area of Maine, she purchased the fashionable dress in Canada. Spring was still far off, so she chose to wear a bright and colorful dress, rather than blending into the white on white of winter. While a foggy wedding day may have concerned some soon-to-wed couples, it caused her groom, Lester Parker to comment that he was glad he could see her through “the weather.” Unfortunately, no wedding photographs were taken so we cannot see how stunning she looked in her shimmering flapper dress – although one can surmise she was beaming! The dress was (and is) eye-catching. It no doubt had a slight orange glow from the light silk. 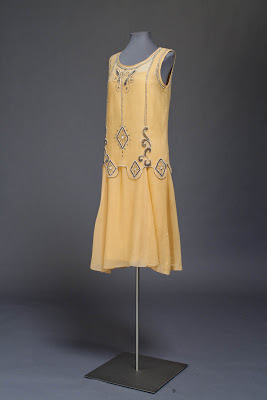 With its uneven hemline, typical of the period, and its glimmering beads and sequins, outlining the low waist and trimming the sleeveless garment, Madeline would have been stunning on her wedding day. Her matching hat completed the ensemble. One senses she exuded confidence, for not every bride would feel comfortable making such a bold statement. Correspondence between the author and Janith Bergeron, April, 2013. Janith Bergeron is proprietress of Designs By Janith and Co-Director of The Sewing Tree, Dover, New Hampshire. Photos of Madeline's dress below are courtesy American History Textile Museum; Frank Graham, photographer. Whether extravagant or frugal, traditional or fashion-forward, the story behind a bride’s dress has much to tell us about her life as well as our common culture. A symbol of love and commitment, the wedding dress personifies girlhood fantasies, a moment of transition, a performance of cultural values. 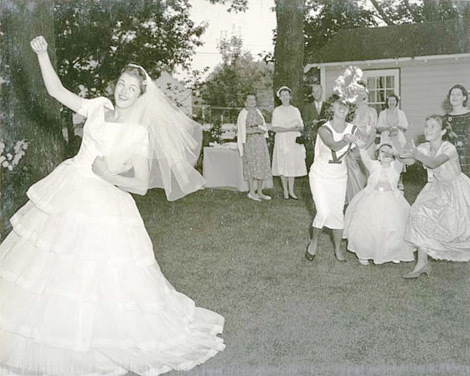 Behind the Veil: Brides and Their Dresses explores how brides over the past 100 years have chosen their wedding dresses, and how their decisions are shaped by fashion, family, and finances. This exhibition highlights not only the dresses worn on the big day, but the stories of the women who wore them – whether a traditional princess-style dress or a funky animal print, whether a simple homemade dress from the early 19th century or a mini worn in 1969. How have women created alternatives to the iconic white dress, or how have they embraced the fairytale wedding? 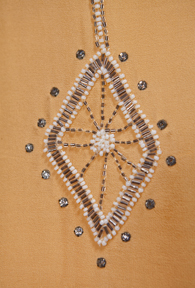 More than an historical survey, this exhibition explores generations of women and the stories of their bridal attire.